This is my favorite little chef, Avery. You already know Avery, if you follow me on Instagram. We are BFFs. We love to do girls' lunches with her Mom. Avery is 20 months old and already baking cookies for her class parties! She was making Halloween cookies in this photo. She is concentrating really hard on getting her measurements right. That is a sign of a good baker! I think it is so much fun to cook with kids and get them involved in the kitchen. I loved cooking when I was a kid, and it thrills me that my little friend shares my love of cooking. It is also a great excuse to put Avery in an apron and chef hat. I'm DYING over the cuteness! Last week was the premiere of Season Four of MASTERCHEF JUNIOR on FOX! After a nationwide search, 24 of the best junior home cooks (ages 8 to 13) in the country are competing in the MASTERCHEF JUNIOR kitchen. The show is hosted by the award-winning Chef Gordon Ramsay. Chef Ramsay is joined by acclaimed chef Graham Elliot and renowned pastry chef Christina Tosi on the MASTERCHEF JUNIOR judging panel. They will coach, encourage and teach the kids new tricks of the trade during the competition. MASTERCHEF JUNIOR on FOX is super fun to watch. I was totally blown away by the kids on the show. They are super creative and can cook better than most adult chefs! We can all get some inspiration from these talented kids! In the first episode the kids made some amazing burgers and fun sides (I wanted to eat them all) and incredible desserts with marshmallows. In addition to the cooking, there was tons of fun on the show. There was even a Gordon Ramsay piñata and a marshmallow explosion! The junior chefs will face exciting challenges during the season, including a kid-only birthday party, a tag-team challenge, a cupcake frosting face-off and the fan-favorite pop-up restaurant. They will compete challenges until one talented kid is named America’s newest MASTERCHEF JUNIOR! They will take home the MASTERCHEF JUNIOR trophy and $100,000 grand prize. 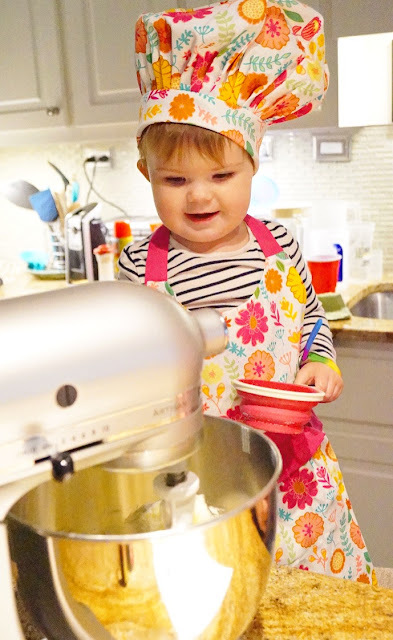 Chef Avery has a few more years until she can compete on MASTERCHEF JUNIOR on FOX, but you can bet she will give everyone a run for their money when her time comes! MASTERCHEF JUNIOR Fridays at 8/7c on FOX! Some of my favorite ways to cook with kids is to get them in the kitchen and getting ingredients, mixing and even rinsing dishes to put in the dishwasher! When my daughter helps plan the menu, she is much more excited about helping in the kitchen and eating dinner! We like to bake muffins. We enjoy baking cookies and cupcakes. I love to cook with the kids and make their easy kids meals which is quesadillas, tacos and mini pizzas. We always have fun making all kinds of meals together! I like to take the kids out to the garden and pick some fresh produce and then cook something with it. For example, we might pick some peppers, tomatoes and onions and then make a home made pizza. Or some fresh zucchini and use the spiralizer to make a ‘pasta’ dish. It’s a great way to get kids to try something new. I love cooking recipes with my kids that are 6 ingredients or less, like Sloppy Joes & 3-Ingredient Peant Butter Cookies, but I also love cooking recipes that have been in the family so they learn how to make our family favorites! To avoid a disaster, I never let them measure over what we are preparing. I giev them a a paper plate & have them measure over it. My daughter likes to help me make desserts. 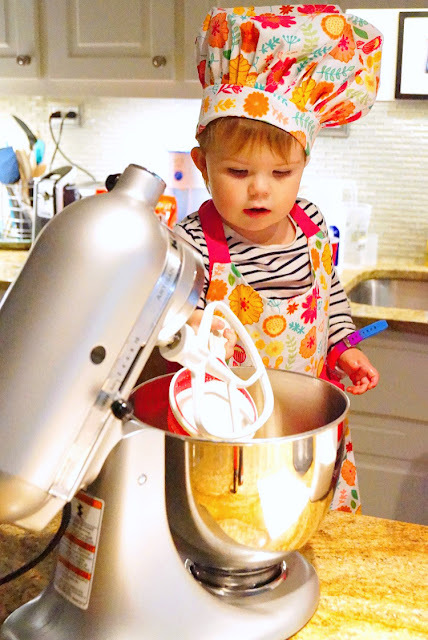 I let her add the ingredients and use the mixer. I am teaching my granddaughter how to cook nightly meals so I have her participate in the meal planning, grocery shopping, meal prep and cooking. She is getting to be such a good little cook. The kids love to help out in the kitchen. We keep it simple and have them help measure, mix and frost things. No kids of my own, but when I'm at my friend's house her granddaughter helps in the kitchen. We put the veggie tray together and put the dip in the bowl. I let my grand kids crush cracker or cookies, tear bread and crack eggs. They are great cake/cupcake decorators too. Making their favorite foods is a great way to get kids involved in cooking. Whether it's frosting cookies or sprinkling cheese on pizza they are proud of what they have done. We enjoy making cookies, muffins, and cinnamon rolls together. My daughter loves to help out in the kitchen. Her favorite activity is chopping up mushrooms or other soft vegetables for me. I love watching these kids and always amazed at their talent! We like cooking "fun" food like burgers and pizzas ; my son love cooking desserts too, we make a chocolate cake every sunday ! I like to make pizza with my son. My nieces love to help me bake as I let them put the things in the kitchen aid mixer. I also let them make their own pizza. Here is an example! http://my-shittykitchen.blogspot.com/2015/09/a-chaotic-friday-recap-puppyroni-pizza.html I updated the post to link to your giveaway to count for an entry and reposted it today! We love to bake cookies together. My daughter loves to "cook" in the kitchen... whether it's baking cookies or brownies or stirring the sugar for the sweet tea... she's a big helper. Her most recent favorite is handing me the red potatoes to chop up and then she puts them in the boiler. My kids love to dump the ingredients into the bowl and stir really good! My kitchen always looks like a tornado went through it after we are done but at least they had fun cooking! I love making pizzas together!